A friend recently had these ingredients on her kitchen bench-top and being the inquisitive me that I am, I asked what she could be making with a packet of malt biscuits, Eskimo lollies (sweets), condensed milk, butter and coconut. To her horror, I had to admit that I had never heard of, nor had I tried one of New Zealand’s iconic traditional kid’s slices – Lolly Cake. Quite aptly named, I might add, as the Eskimos are the lollies, and can be replaced with other types should you so choose. Wikipedia describes Eskimo lollies as “firm but soft and chewy marshmallows”. I’ll add that they are flavoured too so each colour adds a different taste. In all my years in New Zealand, to be quite honest, I’d seen these slices sitting in bakeries and cafés, but had never felt drawn to them sufficiently to investigate further. They just didn’t look that appetising, but that’s probably because they look a lot sweeter than they are and I’m not 5 years old. Even once I’d combined all ingredients into my mixing bowl and gazed down upon them, I definitely recall thinking that the mixture is so unappealing that I would probably never make them again…but then after a few hours you get to taste it and, well, it is worth it. Definitely more of a kid’s slice for parties, treats or cake stalls at school fairs, but a very easy non-bake slice which Kiwi kids absolutely love. And I have noticed that the adults become rather nostalgic too. No idea how the lollies came about, are so named, or why they are in the shape of little people in traditional Eskimo dress and I certainly don’t want to get into that type of discussion here, but apparently they’ve been around for 54 years or thereabouts and are a very popular Kiwi confectionary. Melt butter over a low heat, do not boil. Add condensed milk and stir until combined – about 10 minutes. Be careful to watch the mixture and have it on a low heat as it could catch on the bottom of the pan and spoil everything. Crush the biscuits. There are a number of ways to do this: a food processor if you want a very fine crumb; in a plastic bag that seals well. Remove all air from the bag and bash with a rolling pin; or use the back of a glass in a big mixing bowl. Whichever way you choose, I like to have a mixture of crumb sizes to give the slice real texture, so a few bigger pieces of biscuit are good. Chop each lolly into about 4 pieces. Combine with the biscuit crumbs in a large mixing bowl. 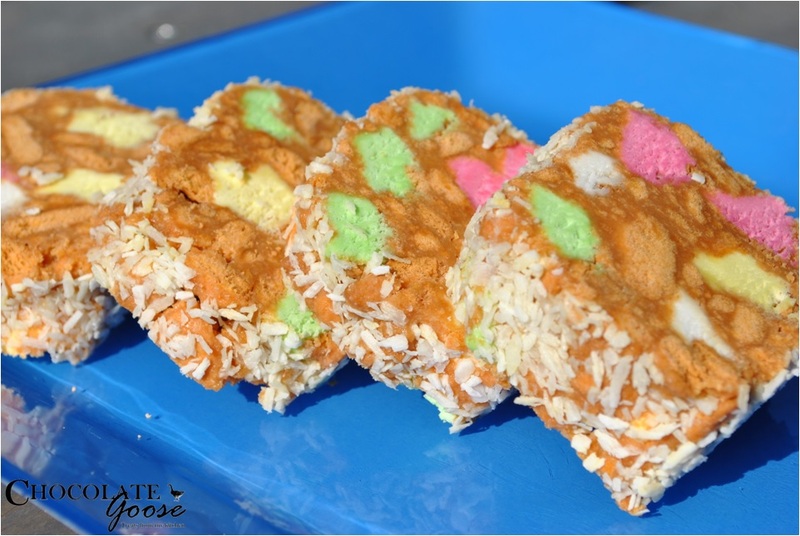 Allow the condensed milk and butter mixture to cool a little and pour over the crumbs and lollies. If the butter is still too hot, it may melt the lollies. Combine all ingredients and then using your hands, shape into a log/roll. Spread the coconut out on a platter or board and roll the log in the coconut. You may prefer to have two smaller rolls – whatever works for you. Place the coconut covered roll into the fridge for a few hours or overnight and once set, slice and serve.